Whilst large meetings and conferences will require more forethought and preparation most companies frequently conduct small meetings on a daily or weekly basis. Although such meetings are less formal and require much less planning some thought should still go into them to ensure they are as successful as possible. Is a meeting the best option? The first thing to consider is whether the meeting is really necessary. Face to face discussions are very helpful but sometimes an email or phone call may be sufficient, especially if a meeting would require a lot of logistical effort (i.e. : pulling sales people in off the field). What should this meeting accomplish? Even a daily briefing should have an objective. Knowing what the meeting is about and what the objectives of the meeting are helps to clarify who should attend and how long the meeting will take. What do we need to discuss? List the topics that need to be covered in order to achieve the objectives. Then determine the most appropriate order and structure for each. Consider the length of time to be allocated to each topic, depending on how important each one is. Those invited to attend the meeting should be those who need to be informed about the topics, are affected by the issues, will be able to contribute to the required outcomes, and are authorised to make decisions or speak for those who do. The venue must be convenient and have the right facilities and the date and time must be appropriate for those attending. 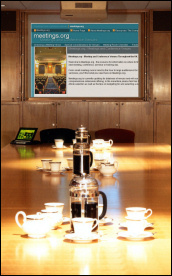 You may have to book a meeting venue or you may be able to simply use someone's office. Whichever option is chosen ensure that everyone expected to attend is given as much notice as possible. This allows them to not only rearrange their schedule and be on time but also to think about the agenda and prepare any thoughts or material they may need to bring. As soon as possible after even a small meeting a note should be sent to all who attended outlining what was discussed, what was decided and who was assigned to any actions. This "official" record is important for follow up meetings and to ensure that meeting objectives and any decisions or actions agreed upon are successfully carried out.